This past month, we were honored to style a bridal shower for the books! N and I we're so excited to have the chance to do everything for the sweetest bride - we designed and mailed the invitations, helped choose the venue, prepared the food, put together the florals, and of course, styled the rooms. We had so much fun serving and taking photos and we couldn't wait to share with you all. The client wanted us to focus on the bride's color scheme and theme for her wedding - rustic and tiffany blue! We are all about rustic and greenery, and couldn't have loved the venue our client chose more. If you have need of a space near Fort Worth, TX, look no further than Elm Street Studio in Keller. They have two really nice rooms, an art gallery, and plenty of room outside. We really enjoyed working with the owners and had a blast setting up everything beforehand. Again, thank you to this sweet bride for letting us be a part of your celebration -- we had a blast and can't wait to get started with what we have in store the rest of this year! So, it's been a few weeks since N or I have posted - Life is crazy right about now. We booked 3 events in January and have been going on all cylinders. We did get to take a break and head out to the Napa Valley in California in February, and oh man, MAJOR inspiration. We all landed in SFO on a Thursday morning then rented a car and headed up the 101 to Sausalito for a quick bite to eat at Fred's Place (best breakfast in the world). After our tummies and hearts were full from a great meal, we packed back into the SUV and headed to our home for the weekend in Sonoma. The house we rented on Air BNB was actually on the vineyard that belongs to our favorite place for champagne, Chateau Domaine Carneros. I can't tell you how relaxing it was to wake up and have this view of the vineyard and fog while drinking my coffee and having quiet time. We visited several wineries on Friday, including driving an epic winding drive up a mountain to Pride Mountain Vineyards (highly recommended). Interesting fact, Pride Mountain actually splits the Sonoma/Napa Valley line, so they have to move their wine press physically back and forth across the line during production - naturally I stood on both sides at once. Other vineyards we loved were Hess Collection, Clos du Vol, and Castello di Amorosa - which you know, was built in exact representation of a Tuscan castle. When life gets going and you get in a flow, it gets progressively harder to just stop and enjoy where you're at and refocus on where you want to go. This trip ended up being just that for N and I and we're so excited to share with you this month some big plans ahead! Keep an eye out for posts on upcoming pop-up events, showers, gatherings and even a JGE Giveaway that we have planned for next month!! We also ask for your prayers as we approach some different deadlines and ideas we have brewing. Where do you like to travel or go to for inspiration?! We need even more ideas! Our personal resolutions have slightly improved, but nothing tops our JGE resolution because it’s simple, sweet and includes YOU. We want to help YOU celebrate life. The Gather package includes décor, favors, games, drinks, dessert, theme of choice and music. Gather includes events like wedding and baby showers, graduations, holiday parties, and rehearsal dinners. Package starts at $395. The Celebrate package includes invitations, custom hand lettering, custom décor, original theme, dessert of choice, favors, drinks and games. Celebrate includes children and adult themed birthday parties or anniversary parties. Package starts at $495. The Corporate package includes invitations, décor, theme of choice, programs, coordination with venue/caterer and dessert. Corporate includes holiday parties, galas, retreats and board meetings. Package starts at $595-$995. Our mission is to serve your family and friends by providing a fun, trendy, and beautiful way to fellowship together, no matter the reason – we are bringing this concept into the New Year with a bang and we can’t wait to reveal everything we have planned for 2016! Thank you for your support and allowing us to share in your celebrations – it’s the best gift we could ever receive! What can I say? We had a BLAST hosting this pairing with some of our favorite small businesses in Fort Worth. It had everything for the perfect girls night; wine, so much cheese, gorgeous jewelry from Kennamer Alexandra, yummy desserts from Stir Crazy Baked Goods and fabulous clothes from Beehive Fort Worth. First, a bit about Kennamer Alexandra. This girl does it all. She's a fantastic photographer (she took pictures of all the yummy treats! ), an incredible designer and artist, oh, and she makes awesome jewelry as well. You can visit her etsy shop here to find some perfect last minute stocking stuffers! Her line features lots of brass, silk tassels, and gorgeous beads. You can find pretty much anything for anyone on your list, while shopping small and supporting small businesses. Giving a unique, handmade gift that is affordable always means a lot! Her store features everything from bracelets, to earrings, to necklaces of all different kinds and lengths. Stir Crazy Baked Goods, was kind enough to provide some delicious treats for our guests to try as well! They provided their to-die-for cheese rolls, and my personal favorite, mini-pies. Honestly, I love these things because they're big enough to satisfy any craving, but then you don't have the guilt of eating an entire pie alone. Because I would. They're THAT good. If you haven't had the pleasure of visiting one of their two locations (Magnolia or Dagget) you need to drop what you're doing and GO RIGHT NOW. No joke - and if the owner Robbie happens to be there, make sure to tell her hello and say thank you for creating heaven on earth. She is one of the friendliest and brightest people we've met, and we're so excited to feature her story on our blog this coming January! Our next Preferred Partner, Beehive Boutique Fort Worth, also provided us with some amazing attire for the event! The first 5 guests who responded were lucky enough to attend their own personal styling sesh at the Hive, and wore their picks to the event (and they looked amazing). I'm going to be honest - I've been shopping there for years, and most of my closet consists of their clothes for a reason. They are located here right off of Camp Bowie. Chelsea, the manager, is so much fun and actually cares about the people who shop at Beehive and builds relationships with her clients. Everyone who works at Beehive is kind and always extremely helpful. If you've never been, indulge yourself and check out their instagram feed, @beehiveftworth, for updates about new styles and events! The event as a whole was beautiful and so much fun. Special shout out to Krista for hosting this event in your gorgeous home! Thank you to all the wonderful ladies who came and enjoyed, and also to the vendors who provided all we needed for a truly memorable night! If you missed out, have no fear! JGE will be hosting other events for our readers over the winter and spring. Also, don't forget that we have a current promotion for 30% any event price if booked before December 15th! Time is running out, so if you're interested visit here and fill out the form with our discount code. We love you all and wish you the merriest Christmas season of all! We are so humbled and excited to share with you today the heart behind AE Photography - Over the next few months, we are sharing our favorite small businesses and preferred partners (the inspiration behind your events). We get the opportunity to work with these amazing people to help make our events magical, and we want to shout from the rooftops why you should be passionate about what they do as well! Thank you Aubree for sharing your sweet heart - we hope you enjoy and learn something powerful. Make sure to check out more of her work here. A: I’m a DWF based photographer with an obsession with queso, my awesome husband Jared, and my puppy Willow. Q: Oh, we love that pup! She's beyond adorable. Now, we want to know what made you want to start your own business? A: I wanted to find my own way in the creative world and follow my passion. I first started out in design and figured I would be working for agencies most of my career. But the longer I designed, the more drawn to photography I found myself. After a few bumps and turns in the road, I opened officially AE Photography in 2015. I now have the freedom to fully explore my craft, work with the types of people I want, and pursue what excites me! Q: What type of photography do you do the most? What do you enjoy the most and why? A: I am a portrait, editorial, and lifestyle photographer. I LOVE shooting couples. There’s something so humbling and magical in those shoots that makes my heart so happy! With every shoot I have one goal in mind: to not “shoot what it looks like, [but] shoot what it feels like.” That’s a quote by David Alan Harvey that has become my business motto. Whats the point of a photo if you don’t feel something? Q: Love that we can literally feel your passion when you talk about your trade - On that note, what inspires your passion? A: Movement inspires me. A ripple in water, a couple melting into a kiss, a splash in a pool. Anything and everything that tells a story through movement makes me want to grab my camera and shoot away. Q: What is the most challenging part about running your own business? A: I think the most challenging part of running my own business is to appreciate where I’m at. It’s easy to look at pinterest or other photographers and think, “I must be doing it wrong…” because of the clients they work with or the places they travel. Comparing yourself is probably the worst thing you can do as any sort of business owner. I think in my young business, that’s been the most important thing I’ve learned and the hardest thing to keep in check. I am my own photographer. The best thing I can do for myself is to focus, be proud of how far I’ve come, and push myself to my own limits. Q: That was really beautifully stated - It seems we all feel pressure to compare our business instead of celebrating others victories and our own... When did you become interested in photography? A: I’ve always been fascinated with the still picture. My mother is a photographer and she instilled my obsession at a young age. I have been incredibly blessed to have two supportive parents who nurtured an appreciation for all things creative. I really came into considering it as a profession in college when I took my first film class. There’s nothing more relaxing than being in the dark room and developing a photo that you took. The whole process is like my very own therapy session. After that, I started designing right out of college then through the grace of God I got the courage to jump into the deep end and I’m never looking back. Q: And now for the big one - Why is your work important to you? A: My work is important to me because it’s about relationships. The joy of shooting what it feels like is that I get the opportunity to listen to people, get involved with their life in some small way, and share all kinds of love and happiness. Q: What advice would you give anyone looking to start their own business? It's one of our favorite holidays, and this year N and I are making a list of all the things that we're grateful for this year - the main one being the launch of JGE! It's been such a whirlwind, and we've learned so much. By now, y'all have seen how passionate we are about small businesses and supporting shopping small. If you're thinking of starting your own business or have questions and just want to know the process we went through, we will have a post coming soon for you! For now, here are some thoughts from S and N about what we're most thankful for in life. S: I am so thankful for family. My sweet husband, my community and my parents have been an endless supply of support and love during the launch of JGE. I know that there is no way that I could have found Noelle, or pursued my dream of bringing joy to others without them! The encouragement is the best gift I could ever receive. There are so many people and circumstances waiting on you to fail or mess up, but having those there to hold you up and to remind you that you are fully known and fully loved no matter what you do. That truth right there is what I am MOST THANKFUL FOR. Jesus's sweet love and never ending grace is really what life on this earth is about. Reflecting His love for His people, taking care of each other and looking out for each other - I'm so grateful that I get to witness that personally through every season of life. To Noelle, as sappy as it is, I couldn't have found a more talented partner than you. You are so incredibly kind and creative - Thank you for your patience and your incredible friendship. To our readers and clients, please take time to focus on what is good in your life. You may be in a season of hurt or darkness or maybe a season of joy and deliverance, but through it all there is good in people and in those that are in your life. Seek people out who will hold you accountable but love you deeply. Be thankful, and let them know the impact they have on your life. You have all had a great impact on ours, and we are SO grateful for you every day! With that being said, make sure to eat plenty of turkey and spend time with those you love most today! N: Goodness. Where do I even begin? First and foremost, I am thankful for the FREE gift of salvation from God through His son, Jesus Christ. Without Him, I have nothing. He has blessed me with wonderful parents, in-laws, friends, community and a ( good lookin' ) husband who loves me unconditionally. I am thankful for you, Sarah, for treating me like a sister since our very first encounter. I am humbled to get to work alongside you and draw inspiration from your ambition and genuine desire to bring happiness to others. And a big thank you to our readers and clients for having confidence in JGE. We are grateful for the opportunity to serve you! I am also thankful for the simple things in life that are sometimes overlooked, one being the magnificent and intricate creation we live in. Think about the thousands of different kinds of birds there are....and flowers…and trees…and animals…and bugs!!! Bugs are actually fascinating little boogers if you really take time to look at them. It's truly mind blowing how detailed they are. A few more simple things I’m thankful for include, the kisses my husband gives me every morning as I leave for work, the beautiful church bells that chime hymns every weekend right by my house, the warm greetings when I walk into work on a Monday morning, tiny hugs from my nephews, a delicious home cooked meal from mom when I visit my parents, a friendly hello from someone I don't know and so much more. I feel like a lot of us (including me) tend to focus on what's missing in our lives instead of focusing on the little blessings that are right in front of us every day. I hope that you will take time to look for those simple things to be thankful for this season and every day after... Have a great Thanksgiving everyone!!! You heard right... JGE is offering a 30% off Holiday Promotion!! The first 5 people to fill out this form and include the code JGEHOLIDAYS in the message field will receive 30% off their event booking! The event date must be prior to January 31st, 2016 and the promotion will end on December 15th! So you have a month to start getting your ideas together and contact us to plan your event. We can't wait to work with you!! Terms and Conditions: You must be over 18 to book an event with Jillian Grace Events. The discount only includes themes and activities from the package base price. Does not include any A La Carte items from our pricing guides. 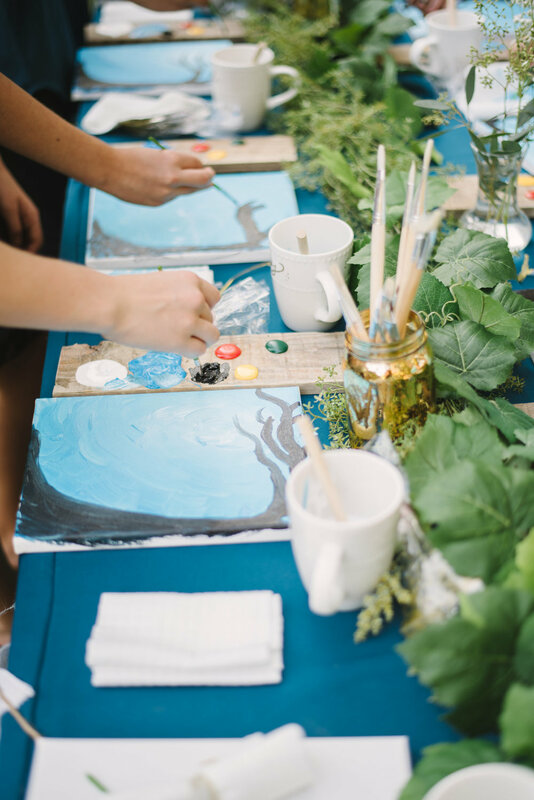 The theme was Farmhouse Tea Party, and the activities included painting and flower crown making (how dreamy can you get right?). The girls absolutely loved the chance to get their hands dirty, and we were so impressed with their artistic abilities! It truly was the perfect party for them. From the moment they arrived, their faces lit up with excitement for all the things we had planned for them... and for, you know, the cake (which really was too gorgeous to eat). Just look at those little faces!! The first activity of the night was painting - we used 8X10 canvases, wood painting pallets that we hand crafted, and many different types of brushes. They also got to use their cute hand-made, personalized tea cups with their names on them! Sarah hand-lettered all of the tea cups herself, and the girls just loved them. We really were impressed with how talented these girls were - serious painting skills. Isn't she the most joyful thing you've ever seen?! 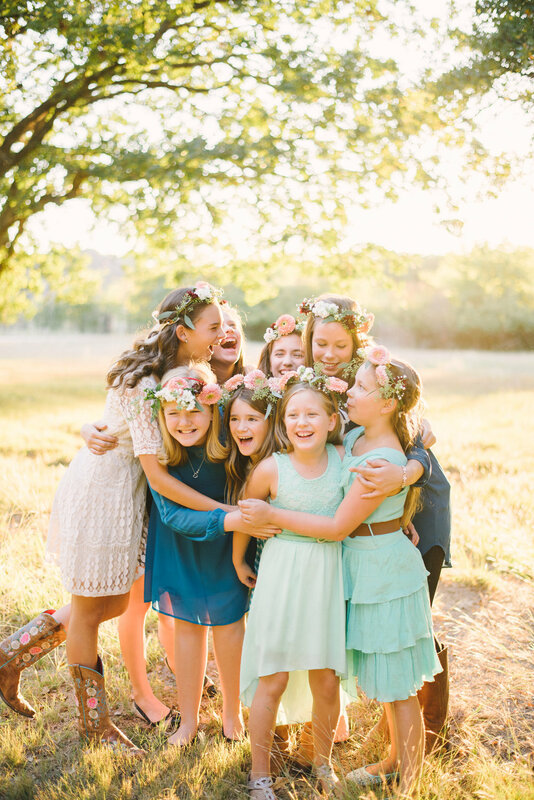 And then came the flower crowns... be still my heart. These girls had some serious artistic capabilities - I mean we were really impressed! Guys, we have a secret for you... Not only is Noelle an incredible painter, but she can bake!! This cake was too perfect, and the thing birthday dreams are made of - and she made it. What can this girl not do?? I mean, it was blue. We really think we could die from cuteness overload right now... but we can't because we have many more Celebrations and Gatherings headed your way! Remember, if you want some of these "sigh worthy" details at your next event, head to our Packages page and fill out the form for a detailed package plan straight from the JGE team! So for now, au revoir, but we'll be back soon with more gorgeousness on the JGE Blog! Well, we had a blast this fall planning our launch. It had everything: Popcorn, rootbeer, pumpkins, s'mores and of course, awesome people! This crew seriously was so much fun to work with, We also were blessed with the amazing talent of AE Photography. This girl is not only one of the most encouraging people I have ever been around - she really knows how to make everyone feel comfortable in front of her lens! Check out more on her story and her business this coming Friday, on the JGE Blog. We also were so honored for this shoot to be featured on Inspired By This - We don't think it could have gone any better, but let us know what you think!! When you think about all the gatherings that happen this time of year, there is some real inspiration for creating an inviting and warm space - i've put some of my favorite tips together below for you! The colors that make up the season are inherintley warm and inviting. Play up the plaids and warm golden tones to really give your gathering that inviting aura. Look for props that easily compliment those golden tones like pumpkins, lanterns, and wooden furniture. You can easily match up solids and patterns together for a more elegant feel. Fall and winter make up the half of the year that makes you just want to curl up and eat some pie or drink a piping hot cup of cider - same goes for your gatherings! It's really easy to run by your local market for supplies and prepare a elegant brie and meat plate or an incredibly yummy casserole or stew. Keep it simple - people love appetizers, and it's easy to fill your guests up quickly while keeping your stress level down. We'll be sharing some of our favorite recipes down the road, so keep an eye out! Keep it simple, and keep yourself sane. Guests are coming to your gathering not to see how much work you put into everything looking like perfection, but to honestly enjoy themselves. There is a balance between presentation, and laughing about slightly burning the turkey. Create a space that makes it easy for your guests to lounge and laugh together - formality and structure tends to make a party feel rushed or too organized. When in doubt, pick the top 5 details that you want to be just right, and find some way to give yourself a little break on the others. Details can make a space, but your nerves can break it! Remember, if you need advice or help planning your next gathering, visit our "Packages" page and fill out the form to receive our best plan for you! Guys… we are so beyond pumped to introduce Jillian Grace Events officially to the world. We have had so much fun rebranding, and putting together some beautiful packages and plans for your upcoming celebrations. We want to be able to share our vision for what JGE represents, and why we're doing what we love most! So grab a cup of coffee (or tea), a blanket, and your planner and find out why JGE should plan your next celebration! Q: What made you decide to take on this venture? 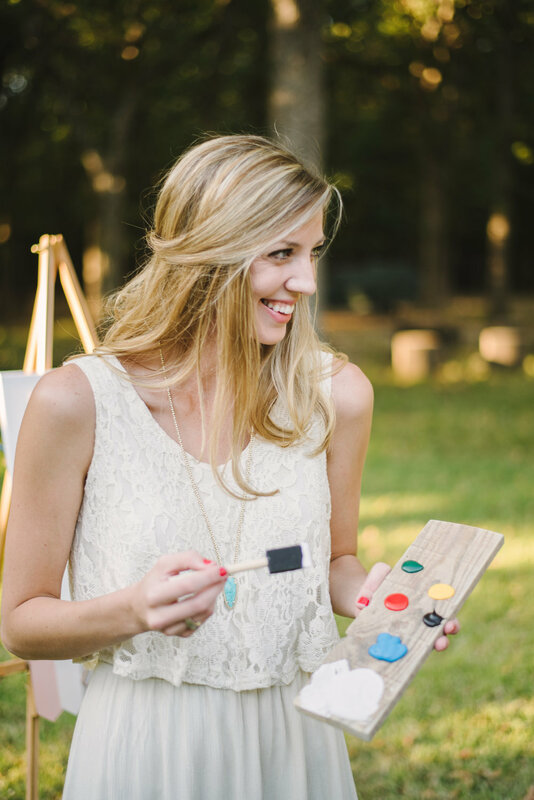 Noelle: After discovering that Sarah and I have the same passion for celebrating life through event planning, we carefully prayed and talked it through with our husbands and decided to take a leap of faith by creating JGE. I thrive on the anticipation right before people arrive at our events as well as the gratification that comes after the event has concluded. Another reason I decided to take on this venture is because I know a lot of people get overwhelmed when they think about planning an event/party. Perhaps they know how to throw a party, but don’t have the time. They may not even get to enjoy their own event because they’re either worried they forgot something or they’re exhausted from staying up late finishing last minute details. I love that JGE is able to take on all the responsibilities and be a breath of fresh air to our clients so that they can have a fun stress-free time at their event. Sarah: I've found that I really have always had a passion for organically bringing friends and family together, and making the space feel inviting and warm. There is something about seeing a kids face light up, knowing that all of their friends and family have come together to celebrate their life, that makes me want to make that as magical an experience as possible. The same goes with showers, graduations, or even simple holiday parties. I love to live in the details and know that those can really make an experience extra magical. None of that works though without organic fellowship and friendship… you can't will that into being. Even better, if everyone attending doesn't know one another, I truly believe those details will create an atmosphere that makes it easy to branch out and meet someone new! Q: How did y'all come up with the name Jillian Grace? Noelle: A lot of people have asked us this question and it's kind of a funny story! Sarah and I had been brainstorming a name for our business for a few weeks, then one day Sarah thought about incorporating our middle names somehow. She did not know what my middle name was at that time and just started playing around some ideas beginning with her middle name, Jillian. While she was doodling, the word Grace came to mind and how it seemed to flow effortlessly with Jillian. She was conflicted because she liked the sound of Jillian Grace a lot, but did not want me to feel in any way left out. She quickly texted me, "Hey! What's your middle name?" I wrote back, "It's Grace! How come?" ...... Then the rest is history! Q: What's your favorite part of the whole process from start to finish? Sarah: Seeing the clients vision come to fruition is definitely my favorite part - and through that process, building a new relationship with the client is also always a blast. Each event is a new way to express a new creative thought and see that come to life. I also simply just love seeing people having a great time, and letting all the anxieties and troubles go away, even for a short time. Q: Where do you hope to see Jillian Grace in the future? Sarah and Noelle: We have goals and dreams for JGE, but we also trust that our relationship with our clients will help us know the direction our business needs to grow. Our most prominent goal is to provide our clients with the most exceptional experience possible, and to focus on them, rather than ourselves and what we want out of it. We hope that Jillian Grace will become a symbol of joy and community, while taking the burden of trying to do everything at once away so that you can enjoy your events wholeheartedly! Our tagline is "Creating beautiful ways to Celebrate" - I want that to be what we are about in future, as much as it is now. Hi! We're Sarah & Noelle, the essence behind JGE. Visit our Why We Celebrate page to find out more about our passion behind planning your next Celebration!